Crisis Choirs and Stone Flowers had an amazing time performing together as part of our brand new Resilience, Recovery and Happiness collaboration with health and science organisation Bassajamba and Manchester University’s Division of Psychology and Mental Health. Our new Marketing volunteer, Jake Calvert went along on 6th April at Whitworth Art Gallery, Manchester. Here he tells us about his experience. I recently started volunteering for Music Action International and I’ve been helping out with some of the marketing strategy, particularly on the social media side of things. I’ve been doing this work in the evenings at home – getting to grips with the brilliant work that the organisation does for people who’ve survived war and torture and hopefully helping to make more people aware of this vital support. Having been unaware of Music Action International’s work prior to volunteering, it’s been a pleasure to gain more of an understanding how important it is to create opportunities to make music with refugees and asylum seekers. As a fully paid-up music obsessive, it’s truly inspiring to find creativity being used in such a transformative and hopeful way, and before attending the Crisis Choirs and Stone Flowers performance, I’d been very keen to experience Music Action International’s work in action. The Whitworth is one of my favourite places to spend an hour or two so the performance space overlooking the greenery of the neighbouring park made for a beautiful setting for my first event. 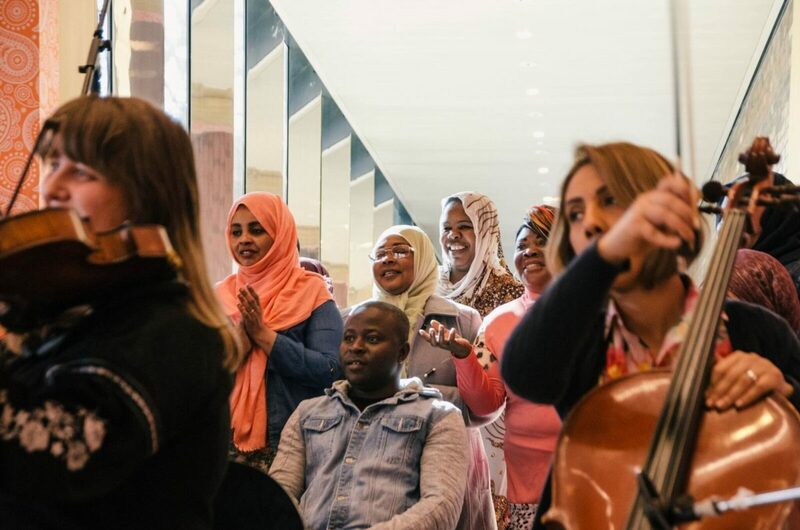 The mixture of traditional music and original compositions told a moving story and I thought a fitting symbol of the richness of collaboration was evident in the diversity of language used – we were treated to the beautiful sounds of Arabic, Farsi and Lingala languages, amongst others. Another thing that struck me was the palpable sense of positivity and delight that the performance poured into the room. It was joyous, which is deeply inspiring when we consider the tremendously difficult circumstances the performers have had to face. 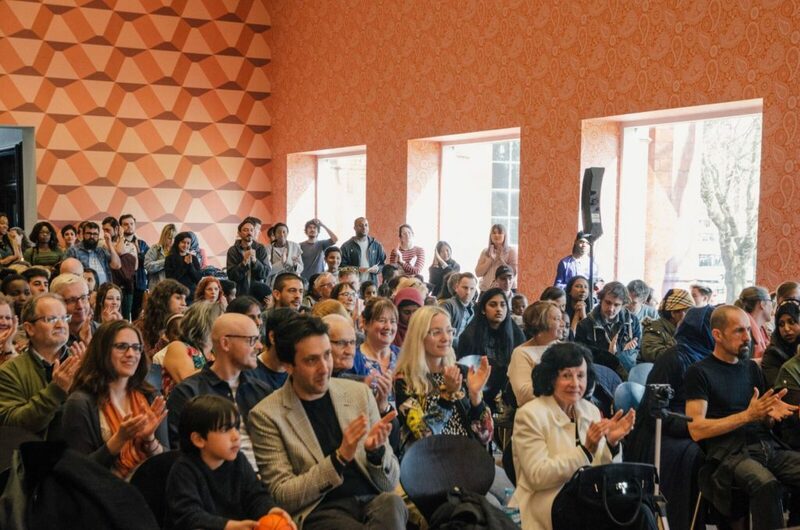 A testament to the unifying power of music – I’m really looking forward to the next event! Crisis Choirs engages refugees through partners Cornerstone [Hulme], Rainbow Haven [Gorton] and BRASS [Bolton]. Most people coming to Crisis Choirs have never performed or written music before. Our music facilitators help people explore their own creativity. Participants write their own lyrics and share ideas which are then shaped into songs. Members of Stone Flowers have fled war, torture and armed conflict across the world including Iran, Egypt, Sri Lanka, Syria, Afghanistan, Cameroon and the Democratic Republic of Congo. Drawing on their different languages, traditions and cultures makes performances powerful and unique. Crisis Choirs supports refugees and asylum seekers in crisis who go to drop-in centres for support. Many have spent years living in refugee camps and many face challenges living in a new and often hostile community. For more information about the collaboration with Bassajamba and Manchester University, go here.